A married couple invite their friends to live communally in a large inherited house. 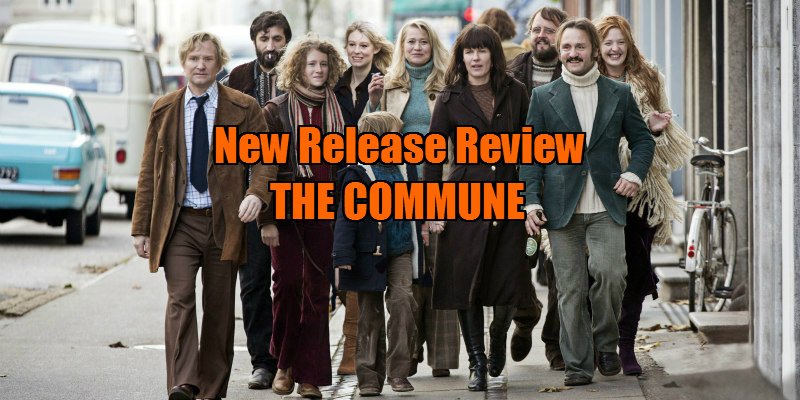 The Commune is a gripping piece of drama and social critique, boasting immaculate period detail that never proves distracting. Following The Hunt and his adaptation of Far from the Madding Crowd, Vinterberg finds himself enjoying the most confident phase of his career since those dogme days of the '90s. 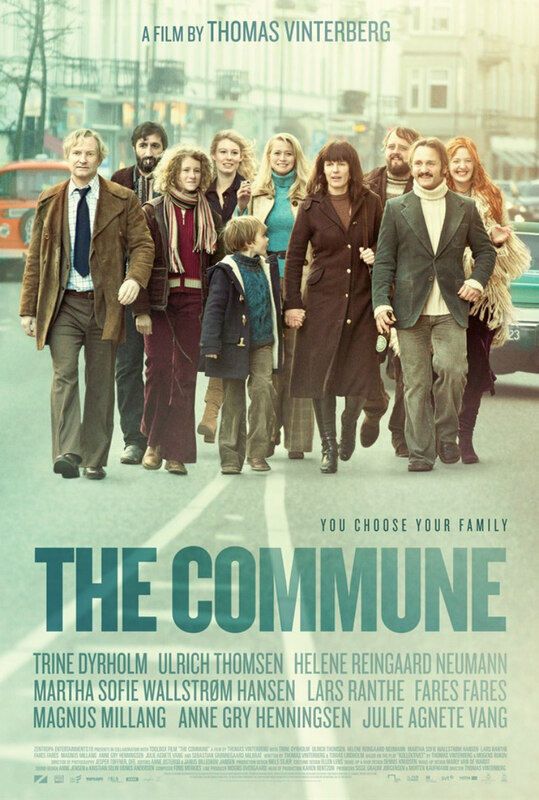 The Commune is in cinemas July 29th 2016. With housing crises prevailing across the western world, the idea of adults living together no longer raises any eyebrows; in any city in Europe or North America you'll find houses acting as home to a collection of housemates in their thirties and forties. Back in the 1970s however, such living arrangements were only to be found among those determined to keep the spirit of the 1960s' peace and love era alive, often with the participants sharing more than just a living space. This was particularly common in Scandinavia, as Northern Europe embraced liberalism with open arms. If you've seen Lukas Moodysson's charming 2000 film Together, you'll have already seen how this sort of thing played out. Now another Scandi auteur, Denmark's Thomas Vinterberg, gives his take, having spent a portion of his childhood in such an arrangement. When introspective college lecturer Erik (Ulrich Thomsen) inherits his parents' large Copenhagen residence, his initial plan is to place it on the market, but his extroverted TV news anchor wife Anna (Trine Dyrholm) talks him into opening up the home to their friends. Erik, Anna and their 14-year-old daughter Freja (Martha Sofie Wallstrom Hansen) are thus joined by an assortment of waifs and strays. Unlike the hippies of Moodysson's commune, the housemates here are relatively bourgeois, at least by the standards of 1970s Scandinavia; at one point they all casually strip off for a spot of naturism, but they favour beer over bongs, and display little interest in 'changing the world'. All goes well until Erik begins an affair with one of his students, the predatory Emma (Helene Reingaard Neumann). Confessing his love for Emma to Anna, Erik is surprised to find his wife invite the young woman to live alongside them in the commune. But while Anna is outwardly liberal in this regard, she begins to slowly crack up, causing tensions to explode throughout the house. Through Anna's heartbreak, Vinterberg seems to be suggesting that his country's socialist outlook is merely a front, that ultimately people are too self-centred for such a system to work, and the growing conservatism of the Northern European nations would seem to suggest he's onto something. Dyrholm is fantastic in the role, her cool blond exterior gradually cracking and giving way to jealousy. Neumann, the actress playing her love rival, bears a striking resemblance to Dyrholm, only a couple of decades younger, which adds an extra cruel dimension to Anna's torment. The Commune doesn't have the comic charm of Together, but it's a gripping piece of drama and social critique, boasting immaculate period detail that never proves distracting. Following The Hunt and his adaptation of Far from the Madding Crowd, Vinterberg finds himself enjoying the most confident phase of his career since those dogme days of the '90s.